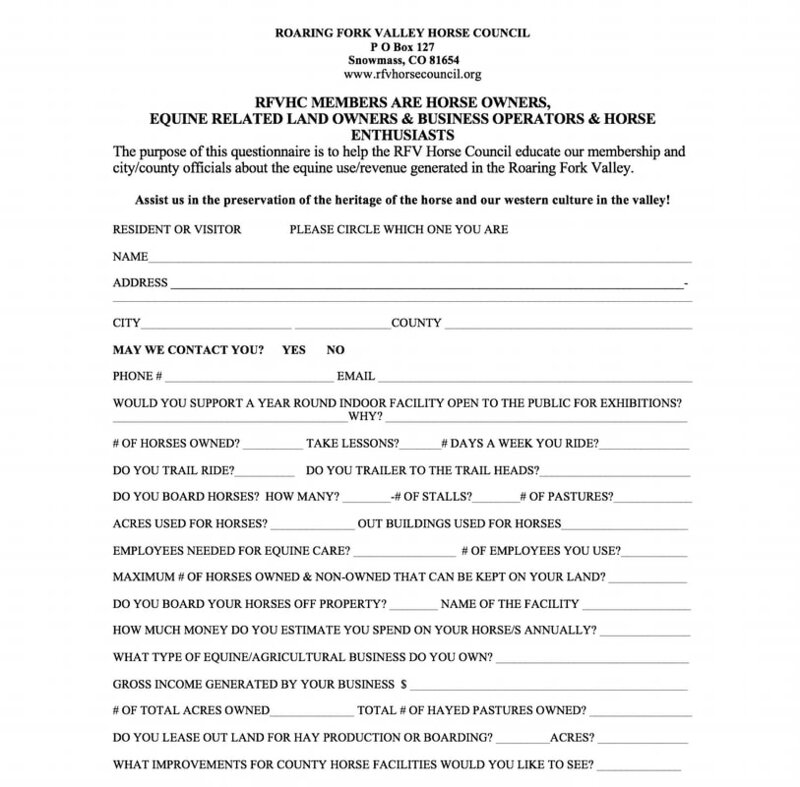 Help us learn about our equine members and business members by filling out the Census.The purpose of this census is to educate our members and City and County officials about the income the horse industry generates in the Roaring Fork Valley.Landowners and business owners pay taxes in all three counties, and we want to preserve the heritage of the horse and our western culture in the valley. Visitors come west to enjoy our Western Heritage. Your information will make a difference to their vacation experiences. The Strang Ranch has been a family run working cattle and horse ranch on Missouri Heights for over 50 years. Mike and Kit Strang have protected the land by placing the lands in a conservation easement. The Aspen Valley Land Trust holds the easement which keep the fields in agriculture and the activities on the land reflecting and preserving the heritage of working ranches in the Roaring Fork and Colorado River Valleys. The John Nieslanik Ranch is a working cattle ranch with 200 acres of farmed ground nestled at the base of Mount Sopris in Carbondale, Colorado. The family has farmed this property since the 1960’s. Today, John, as well as his four sons, Mark, Marty, Mike, and Matt, are still living in the Carbondale community and are all active in ranching lifestyle. Nieslanik Ranch is part of the AVLT, sustaining beautiful open space ranch lands and ranch lifestyles, for this generation and into the future. Please accept these reports with our kindhearted intentions to help bring Cozy Point Ranch up to the standards befitting a City of Aspen Open Space property. We are working on galvanizing the resolve for continued equestrian use of the existing facility, enhancing & restoring the natural riparian areas, supporting the open pastures and hay fields to continue a sustainable equine amenity for our communities public use. We want to support renovation of the existing barn, paddocks, and arenas. We can foresee the construction of a safe & beautiful cross-country course, with bridle paths leading from Cozy Point Equestrian Center to trails on site. We embrace the idea of connecting Cozy Point and the Sky Mountain trail system, with an equestrian, safe, crossing of Brush Creek Road. In 2017, Cozy Point Ranch was in the spotlight, hosting the Aspen Equestrian Team, part of the national organization, the Interscholastic Equestrian Association (IEA), established 2002. We hope that in the years to come, students, riders, instructors and stables will post their good news here on the RFVHC website. .
​Go to our Gallery for pictures, stories and more!  Public access to parking with truck and trailer accommodations – to access the 9,100 acres of Pitkin County and BLM trails on “The Crown”. This process took over two years to complete.  A separate equestrian specific trail in 2016 leading from the parking area, with soft track separate from the RFTA paved bike path, across Glassier Open Space Land, leading to the BLM two track trails on "The Crown”. ​Pitkin County Open Space, the RFVHC and the RFMBA joined up in 2018 and created a Trail Safety Campaign. Running on radio and in the local papers, we are proud of the success of the messaging. Our Pitkin County Open Space land is precious, and paid for by the general public through our land taxes. The Roaring Fork Valley Horse Council (RFVHC) is concerned about the biodiversity and compatible human use on these lands, and also the BLM holdings. Thank you for protecting the natural habitat in our valley. Sutey Ranch. Alternative 4 proposes to manage the Sutey Ranch for the benefit of wildlife especially during the critical winter season balanced with improved access for hunting, horseback riding and mountain biking, as well as agricultural use. Alternative 4 would allow seasonal equestrian use from April 16st to November 30th and mountain biking access through the ranch to the north side of the Red Hill SRMA from June 1 to September 30. The irrigated lands would be managed to provide forage for wildlife. The Sutey Ranch would be made available for livestock grazing as a reserve allotment, and management would be enhanced by combining the Sutey Ranch Allotment with the adjacent Sutey Allotment. Visitor use would be managed to avoid the irrigated fields. Subsequent implementation decisions will address development of equestrian parking facilities, designated trail locations, agricultural management as well as management of cultural resources. By designating seasons of use and a mountain bike access route to the Red Hill SRMA, Alternative 4 strives to reduce conflicts between recreation users as well as reducing impacts on concentration of winter wildlife. Alternative 4 would not add additional rules and/or regulations beyond the guidance established in the 2015 CRVFO Approved RMP. Sutey Ranch. Within the recreation and visitor services program the impacts to recreation visitation would be the similar as those described for Alternative 1. The BLM would not manage or monitor for specific recreation outcomes for visitors as in Alternatives 2 and 3 where it is designated an SRMA. Visitors and the community still would realize recreation outcomes but management will not strive to achieve specific recreation experiences or benefits. Activities. Alternative 4 and 4A is different from Alternative 1 in that it would allow equestrian access from April 16 to November 30 and mountain biking access to the north side of the Red Hill SRMA from June 1 to September 30. The extended season of use would benefit equestrians because it allows horseback riding in the spring and fall without any potential interaction with mountain bikers. 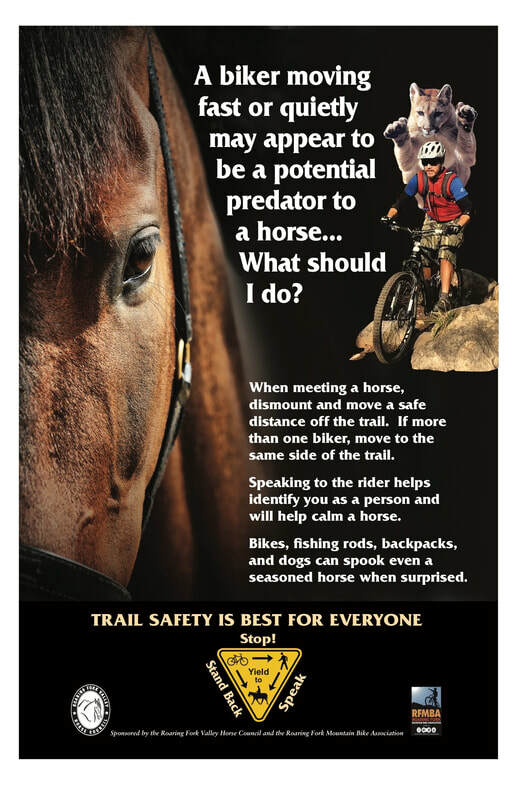 In addition, the BLM is proposing a monitoring standard on the designated mountain bike route to reduce potential conflicts between mountain bikers and equestrians. Hiking use would occur from April 16 through November 30. Hunting would occur within the various hunting seasons. The recreation management approach would offer seasonal recreation opportunities for various users within the context of sustaining wildlife habitat. Recreation Outcomes. 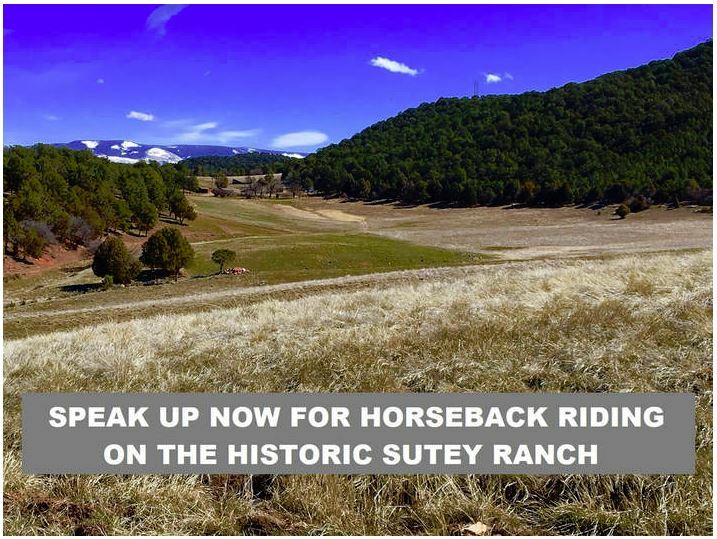 Sutey Ranch would not be managed for specific recreation experiences and benefits as in Alternatives 2 and 3 which would designate the Sutey Ranch as an SRMA. Recreation activity participants would still realize a variety of undefined recreation experiences and benefits. Link to 8.1.18 RFVHC Letter to The Colorado River Valley Field Office - BLM (PDF)the RFVHC submitted this document for the Historic Sutey Ranch and the Haines Parcel to the BLM as our Public Comment. Please read. Link to 7.30.18 RFVHC Letter to BLM Gloria Tibbetts The Historic Suety Ranch on behalf of our members, with member letters, photographs and maps. HISTORY: The FIRST public comment period for the Preliminary Draft Sutey Ranch Land Use Plan Amendment ended on November 5, 2018.regarding the Historic Sutey Ranch recreational plan. We are asking all interested groups, hikers, outdoor lovers, clubs, animal lovers and individuals to continue to participate in the process. Posted here on October 6, 2018 the link to the BLM EA/RMPA and the Appendix A-H is below. These supplemental documents/appendix are important to read through, and do contain many maps and pictures. ANOTHER LINK FOR MORE BLM INFORMATION: More information about the parcels and the planning process is available at https://go.usa.gov/xnvM5. It is so exciting to see these groundswells of effort for equestrian trails! A peaceful ride on a horse and a family hike is worth fighting for, don’t you agree? Here are the 3 alternatives originally suggested by the BLM . The RFVHC will be responding following the meeting, (See our letter of response above) and we welcome any contributions and involvement. Sutey Ranch. Alternative 1 proposes to manage the Sutey Ranch predominantly for the benefit of wildlife and wildlife-related activities such as hunting and wildlife viewing. Seasonal equestrian use (and trailer parking facilities) and mountain biking access to the north side of the Red Hill SRMA would be provided. The irrigated lands would be managed to provide forage for wildlife and temporary, limited livestock grazing. The surrounding ranchlands would be improved through vegetation treatments. The ranch would be closed to mechanized, foot, and horse use in the winter. The BLM would add the Sutey Ranch to stipulation CRVFO-NSO-7 - Priority Wildlife Habitat and prohibit surface occupancy and surface- disturbing activities to protect vegetation cover and forage for wildlife. The BLM would combine the Sutey Ranch with the adjacent Sutey Allotment and manage the Allotment as a reserve allotment that allows limited livestock grazing through a temporary non-renewable permit. Sutey Ranch. Alternative 2 proposes to manage the Sutey Ranch with an emphasis on equestrian activities. The Sutey Ranch would be added as a separate recreation management zone (RMZ) to the Red Hill SRMA. No routes would be designated for mountain biking. To benefit wildlife, visitor use would avoid the irrigated fields and habitat treatments would be implemented. Foot and horse travel would be allowed year-round. The Sutey Ranch would not be available for grazing. The adjacent Sutey Allotment would not be available for grazing due to lack of access through the Sutey Ranch. Sutey Ranch. Alternative 3 proposes to manage the Sutey Ranch as part of the Red Hill SRMA and managed under the Red Hill SRMA Management Framework outlined in Appendix E. To benefit wildlife, recreation use would be seasonally restricted from December 1 to April 15, visitor use would avoid the irrigated fields and habitat treatments would be implemented. Foot and horse travel would be allowed year-round. Under this alternative, the Sutey Ranch would be managed as part of the Sutey grazing allotment and the irrigated fields would be managed primarily for the benefit of livestock. The Rio Grande Trail. - Building and improving for a very long time! Snowmass Village Horse Trails - Hoping to access our horse trails! In newspaper articles from 1905, Miss Catherine, better known as Kate Lindvig, was referred to as the "Cattle Queen of Snow Mass." In the late 1890s, she moved to Colorado from Denmark and ran a boardinghouse in Aspen. Around 1898, she relocated to a ranch at the base of Snowmass Divide and registered her stock brand, a backward L with a 2 on its front side, with the county clerk. She made many of the trails within the wilderness boundary in Snowmass Creek for her cattle’s summer grazing. By 1906, Kate made her final proof that she was working her land to satisfy the 1862 Homestead Act, making the land officially hers. She worked the land, which was referred to as Snowmass Falls Ranch, and raised cattle along with hay and oats as a lone woman. She never married. She made the papers showing up to classes on ranching as the only woman, but she also took classes on what was traditionally "women's work." In 1943, Kate sold the ranch to the Perry family and moved to California to live with relatives at a lower elevation. She passed away in 1957 at the age of 93. It would benefit equestrian access if the Aspen Skiing Company would allow truck and trailer parking in the top lot at Two Creeks. Horseback riders could then ride up the existing two-track trail into the meadow near Gracie’s Cabin and cut through to the Tom Blake Equestrian Trial. This loop is of great importance to our RFVHC members and other equestrians, who have ridden all of these trails for many years prior to the urban explosion and take-over of our horseback riding trails. Link to RFVHC Letter to Garfield and Pitkin County 7/26/18. CHR’s Surrender Program is designed to help responsible horse owners who have run into a long-term life changing situation, resulting in their inability to provide continued to care for their equine friend. Generally, these owners are facing issues such as the death of a spouse, chronic debilitating medical problem, loss of home, or other catastrophic event. If you have found yourself in a difficult position, we encourage you to fill out a Surrender Application with CHR. This is the first step in the process. We cannot guarantee the acceptance of all horses in need of homes, as our facility is always running at or near full capacity. Each surrender is considered on a case-by-case basis and we accept horses as possible. Submit an online Surrender Application now.Online forms not for you? Download a Surrender Application to print and mail today. ​Dr. 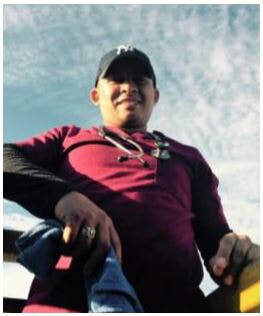 Dennis Benavidez Matamoros is a talented, young veterinarian from Honduras who has been invited to further his education and skillset in the United States! In January, 2017, Dr. Dennis joined the Equitarian Initiative in Costa Rica where he studied under renown farrier, Paul Dorris. Recognizing his talent, Mr. Dorris has generously invited Dr. Dennis to attend a six-week farrier course at Arkansas Horseshoer School. Additionally, Dr. Dennis has been invited to shadow AAEP Board member, Dr. Tracy Turner to continue his education in podiatry and lameness. With your help, we can ensure that Dr. Dennis will participate in this unique opportunity to advance his professional education and impact the health of working equids in the developing world! All donations will help fund his airfare, expenses in the US and a small stipend to support his family in Honduras while he is away. Please join us in supporting Dr. Dennis and the underserved population of equines he treats in Central America! Report by Dr. Lauren Alderman In January of 2019, the Equitarian Initiative’s annual workshop took place for the fourth consecutive year in Costa Rica’s Osa Peninsula. The workshop’s objectives are to provide an understanding of the critical role of working equids, discuss examples of successful Equitarian programs, and allow participants to apply their individual skills in a field setting. Just prior to the arrival of volunteers, EI board members, Dr. Stacy Tinkler and Dr. Dave Turoff traveled to Puerto Jimenez, Costa Rica and spent the day providing instruction and education to local community members. 2019 marks the first year that a community education program has been incorporated into the annual workshop. Participants had the opportunity to learn about basic health care and to enhance understanding of preventative care opportunities. This year’s team consisted of 28 volunteers (veterinarians, veterinary students, farriers, and others) representing eight countries in total. The group was divided into four teams, each assigned to a specific station each day: triage, dentistry, or surgery. The workshop consisted of two days of lecture and four days of clinical field work. Over the course of the week, we treated a total of nearly 350 equine patients. The Harry & Snowman movie at the Wheeler Opera House on Sept 28th, 2016, showed to a sold out, packed theater. 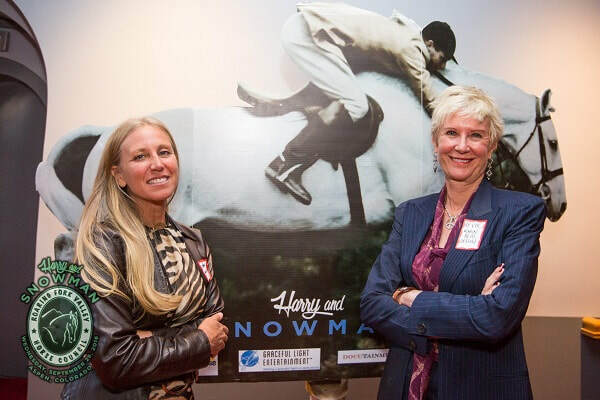 Gabrielle Greeves of WindWalkers and Karin Offield of the RFVHC, at the movie pre screening reception were supported by other valley equestrian charitable organizations. For more event photos click the link for the gallery page. contiguous trail systems. We consider the Roaring Fork Valley to be a perfect place to create a sustainable, generational, legacy plan for the equestrian community. Professional and amateur horse people of all disciplines will be able to use all of these venues, which in turn will support the horse industry.